How Can I Prevent Infestation? 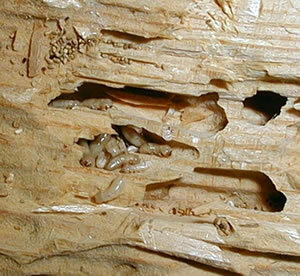 Drywood termites are very common in some southern and western states. They are easily transported to other locations in infested wood, such as within furniture and decorative items. Drywood termites live and feed in dry, sound wood and can cause structural damage. They do not require contact with the soil and, therefore, they do not construct mud tubes. They consume wood with and across the grain, creating irregular, clean galleries. Usually, significant damage requires a longer period to occur, as compared to subterranean termites, since drywood termite colonies develop at a slower rate. Also, since these termites live and feed inside sound wood, signs of external damage may go undetected for years. Infestations may be found in structural timber and woodwork in buildings, furniture, telephone poles, lumber stacked in lumber yards, paper, cloth, fiber insulation boards, and in other products containing cellulose.